On Oct. 8, several familiar spots on Kenyon’s campus were transformed by eight new public works of art. These works, consisting of items ranging from ribbons, to written messages, to old furniture, beckoned to community members for closer examination. The pieces, on display until Oct. 15, were created by students from the ARTS 360: Installation Art class for their first project focused on public art. Some works focus on the viewer’s visual perception. “Shadow Portal,” by Daniela Grande ’20, is located against the construction wall across from Rosse Hall and invites the viewer to open and shut a narrow, black door to observe shadow and contrasts in light and color. Outside the gates of the College, “Stare,” by Emily Barton ’20, encourages viewers to look through rectangular tubes, manipulating slivers of tinted glass to skew their vision. Some — like Sophia Kuvan’s ’19 “How does being in nature affect you?” — take a very hands-on approach. Under one of the trees on the lawn of the Church of the Holy Spirit, a sign presents this thought-provoking title along with a set of color-coded answers. Viewers were invited to take a ribbon with a color matching their answer from the wide selection encircling the tree. Michaela Orr’s ’19 “Disclosure,” just behind “Shadow Portal,” is similarly focused on participant involvement. 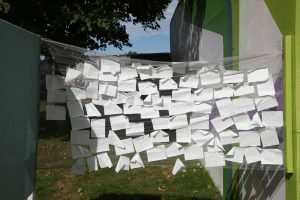 The piece invites viewers into a private booth to write on slips of paper an anonymous description of the last time they cried. These slips, later pinned to wispy netting, hovered there for all to see until rain dissolved them and left them in puddles on the ground. Orr explained how her feelings of isolation during her first year at Kenyon inspired her to create her piece. 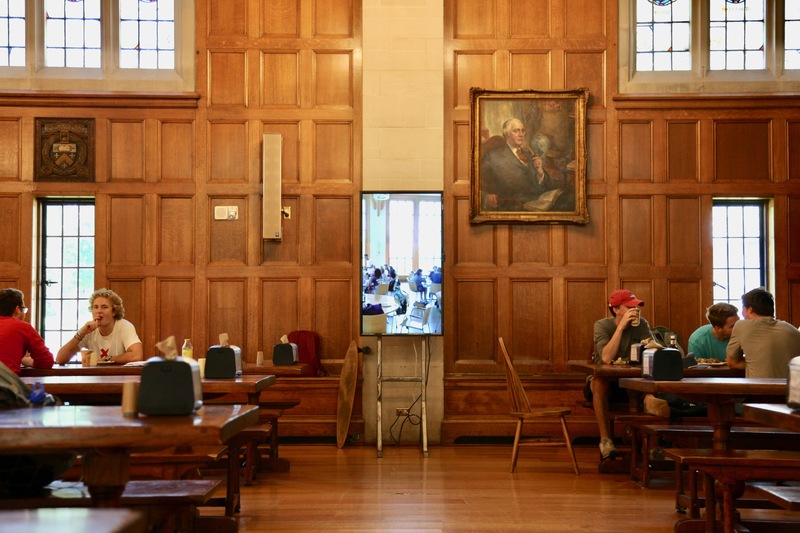 “One of the really weird things about Kenyon is that you are so surrounded by people all the time … but you also feel alienated from everyone,” Orr said. With “Disclosure,” Orr offers an opportunity for the viewer to release these isolating emotions. “For me, the Peer Counselors were a really good resource because they were anonymous,” Orr said. 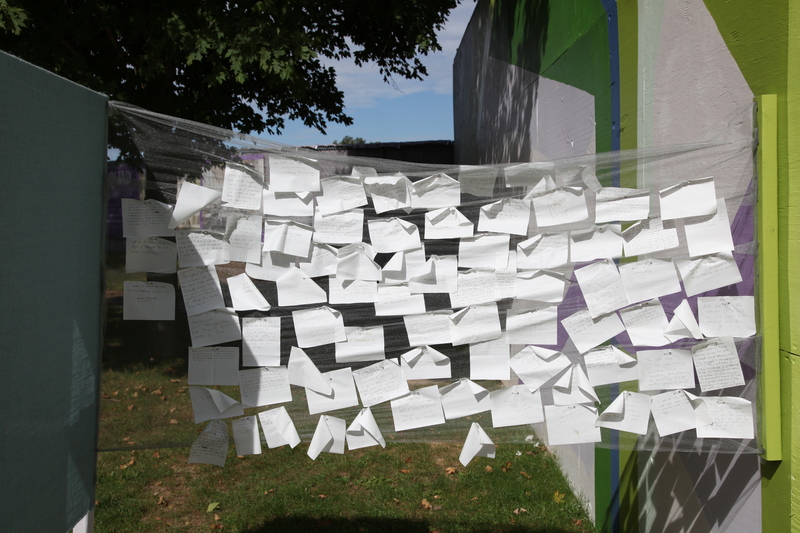 “And I wanted to make a space that was like that, where you could confide in strangers anonymously.” Through this quiet and safe interaction, these private feelings became public and available to the community, providing a sense of connection. Like “Disclosure,” many of these pieces centered around viewer interaction. 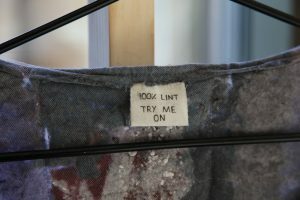 For example, Sarah Gaglione’s ’19 “Speed Queen® Multi-Housing Coin Slide,” placed in the atrium of Peirce Dining Hall, instructs the viewer to try on a jacket pieced together from clumps of lint collected from dryers across campus. Miles Shebar’s ’20 “Consortium” allowed for unintentional participation as two screens, one in Thomas Hall and one in the Great Hall transmitted live images of the happenings on one side to the other. On the other hand, Oscar Dow’s ’19 “Temptation” focused on the question of whether or not interaction was appropriate. The piece, outside Horvitz Hall, taunts viewers with a fenced-in red button, forcing the observer to decide whether or not to give in and press it. Sophie Weir’s ’20 “Not So Distant,” located near Lentz House, invites the viewer into a large-scale, diorama-like construction resembling a decaying living room. The space, heavily scented by an ashtray filled with cigarettes, holds a deteriorating armchair, a small TV and a picture of President Dwight D. Eisenhower, all fully exposed to the elements of the outdoors. “It’s getting really gross,” Weir said. “That’s fully the point of it.” Decay is everywhere: in the disintegrating TV dinner, the brownish glass of water and the dead leaves on the furniture. Weir explained her connection with the mid-century era captured by her work: “It’s not something I lived in,” she said. “It’s sort of from different pop culture references I had absorbed when I was a kid. These ideas I had of what the past looked like, whether or not it was real.” This ambiguous understanding of the past gives the piece a sense of timelessness, lacking the specificity of any particular era. 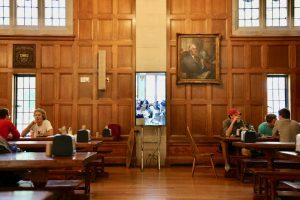 Though each is distinct and representative of specific and individual intentions, all eight pieces from the Public Art Exhibition were able to connect with the Kenyon campus and its inhabitants in ways that allowed for meaningful reflection and insight.